The functionality of the mobile apps is improving rapidly in parallel with the mobile device technologies. According to mobile apps trends, mobile apps becoming important not only with the smartphones but also with wearable technologies and other smart devices, is a proof of these developments. It looks like the year 2017 will be quite exciting for both the owners and users of the mobile apps. It is predicted that technologies that increased in use during 2016 will lead to many new developments in the mobile field during the next year. 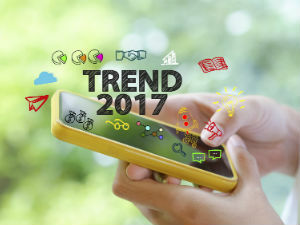 So what trends will be under the spotlight during 2017? Wearable technologies have begun coming into our lives in forms of smart watches, virtual reality goggles, and sports wristbands and they look like they are going to be more in the focus of the mobile users. Thanks to the Apple Watch and the Google Glass as the driving forces of this new field, the wearable smart devices will become more and more accessible. Because, the other global brands besides these two, and some local enterprises too are working on developing their own wearable devices. Therefore, we can say that the apps that will fit the unique dynamics of each of these devices will be in vogue. The HTML5 based hybrid apps, which allow for a single codebase to work on multiple different mobile operating systems, are expected to rise in numbers. It is foreseen that especially the companies will have their apps in hybrid form from the year 2017 on. The reason for this is that it allows for publishing on more than one platforms with shorter project development period. This way, the companies will be able to get more efficiency out of their apps with less budget. The internet of things is setting the trends since each device needs a management app specific to themselves. Each thing that is connected to the internet needs to be accessible over the smartphones or computers to be managed. The number of objects connected to the internet was 17.68 billion this year, and it is expected that this number will rise up to 200 billion until the year 2020. From locking door of the house to turning the laundry machine on, many new features are coming into being with connected devices and with this a need of apps to control smart homes and objects rises, so the companies are going to create such apps. Throughout the year 2016, location-based apps have been one of the most prominent types of apps. Booking, calling a taxi, rewarding and service finding app have been by the users’ sides in their times of need. It is expected that in near future all the mobile apps will be location based. From mapping to security, from transportation to mobile commerce, location information provides various benefits and it looks like going to keep its popularity in the year ahead as well. The evolution of the mobile apps and the trends in technology that change from year to year are caused by the diversification of the user expectations every day. Therefore, the companies owning mobile apps need to prioritize understand the users and to provide a high-quality user experience. This way, it is even possible to become a user favorite regardless of times and mobile apps trends. If you too want to make an app that will be a favorite of the users, you can create it with MobiRoller without the need for any coding knowledge. Create your MobiRoller account now, and take your place in the mobile world without delay.